as perfectly as a picture. Writers are often shy people, content with the company of our solitary selves, the writing implement of our choice, and perhaps a sympathetic and undemanding four legged companion. When we socialize, it is often with other writers, who understand the muttering in hallways, the fistfuls of crumpled notes with half a perfect sentence on each, and that blank look we get when we should be listening, but have only just that moment solved some nagging plot twist. The personality of ourselves,more often than not, fails to live as large as the personality of our work. So I always consider it a bit of a coup when a writer scores a biography—a nod to our lives beyond what we managed to put on the page. Yet Mónica Maristain’s biography of Chilean novelist and poet Roberto Bolaño is a less than traditional offering; it is instead the telling of Bolaño’s life through the voices of his contemporaries, an accounting of his legacy stitched together from the kitchen table (or barstool) memories of friends and family. Maristain herself interviewed Bolaño shortly before his death in 2003, and recounts in her introduction how the impact of their surprisingly vulnerable and intimate interaction compelled her to seek out and interview the people who knew and remembered Bolaño throughout his life. Maristain is an unreserved acolyte, so the book is as much homage as it is a chronicle of the author’s life and work. Infrarealism is a form of approaching the abyss in a way that writers don’t tend to, it is a way of exploring, of writing poetry, of screwing with your fellow man. Maristain’s work is a textural piece rather than a linear narrative. The chapters are arranged in a roughly chronological order, from Bolaño’s boyhood through his death, yet Maristain’s interviews within each chapter often span a larger portion of the author’s life, or are diced into multiple accountings from different sources. The often random quality of the interviews can make the book challenging to follow, yet also imparts a delicious, intimate tone that is hard for a reader to resist. Think of Maristain’s work not as a completely dispassionate and accurate accounting of Bolaño’s life, but as an opportunity for the reader to experience the man through many different charmingly skewed perspectives. 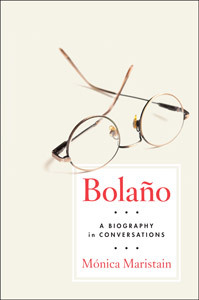 Maristain often tries to help the reader by encapsulating the interviews between pages of her own research and conclusions, where she provides background for the interview subjects: placing them in historical context, commenting on the importance of the relationship, and occasionally offering Bolaño’s own opinion of his comrades. The book is best experienced by sinking into the narrative, allowing the stories to wash through as you read, without trying to maintain a strict grasp on continuity. Once the reader settles into the work, a pattern of voices emerges, and from that pattern a picture of the man—driven, creative, capricious—becomes far more accessible and human than a traditional biography would allow. Maristain: How do you feel when people ask you about Bolaño? Puigdevall: I feel that everything has been said. At least everything that I could say. That we spoke a lot over the telephone, that we occasionally went out for dinner, and that he always ate my dessert if it was chocolate. Does the reader come away from Maristain’s work with an appreciation of her subject’s impact on Latin American literary culture? Possibly—but the patch-worked collection of conversations, opinions, and remembrances is really more of a window into what most readers rarely get to see: the inner non-writer. It paints Bolaño as a man as deeply invested in his family as his work, who declared his children to be “my only motherland,” and discovers the man separate from his craft. Jody Handerson is a working writer and editor living in Boulder, Colorado with an enormous black cat, five bicycles and eighty-two pairs of shoes. She is a contributing editor to TLR.